SEAS student Rahsaan King launched an educational nonprofit, Students of Strength, to help struggling teens. 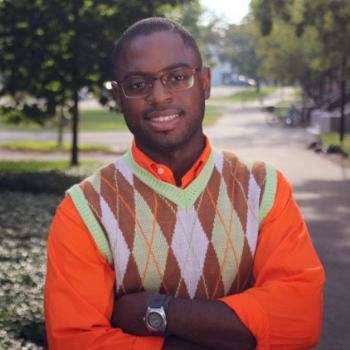 Harvard student Rahsaan King, A.B. ’17, is acutely aware that his life could very easily have taken a tragic turn. While growing up in a tough neighborhood in Houston, King fell in with a rough crowd of young men, many of whom dropped out of school, wound up in prison, or became victims of gang violence. All signs pointed to King following a similar path—he was expelled from the private boarding school he attended, Chinquapin Preparatory School, squandering his first chance for success. Readmitted to Chinquapin, King was given a second chance and this time he buckled down. He was elected to lead the student council, graduated at the top of his class, and was accepted into Harvard, earning a prestigious Gates Millennium Award to supplement his tuition. So after beginning his education at the John A. Paulson School of Engineering and Applied Sciences where he is an applied math concentrator, King took a small-time tutoring business he had started in high school and expanded it into a nationwide educational social enterprise, Students of Strength, that connects underachieving students with on-demand tutors. Students of Strength is unique because it enables middle and high school students to receive academic help instantly from coaches at prestigious universities, including Harvard, Yale, and MIT. The system incorporates a user-friendly mobile app that makes it easy for students to reach tutors and ask questions. Beyond tutoring, academic coaches also serve as mentors who offer advice on preparing for/applying to college, and encouragement when students feel lost, overwhelmed, or hopeless. The program provides test pep and character-building curricula that use videos, games, and practice problems to prepare students for the intellectual and emotional challenges inherent to pursuing higher education. “Because the students are interacting with peers instead of professionals, it makes it much easier for them to relate to their academic coaches,” King said. Having relatable mentors is especially important for the underserved students who are the focus of the program. For every two sessions the organization sells, it donates one to a low-income student. Corporate sponsors are able to “adopt” low-income schools to provide Students of Strength coaches for entire classes of underprivileged students. A dedicated group of volunteer liaisons help King recruit new academic coaches at universities across the nation. He hopes to have 10,000 tutors on board by the end of 2016. Overseeing the organization through a period of explosive growth has been challenging for King, especially as he juggles the demands of his Harvard education. With little business experience, the 21-year-old CEO had to quickly learn how to effectively manage hundreds of people, many of whom are older than he is. Despite the challenges, King was driven by an inexorable desire to help students who might otherwise fall through the cracks. King wants Students of Strength to eventually operate in every state and serve students from every school district. He envisions a curriculum that is broad and deep enough that students could complete their educations, from kindergarten through high school, entirely within the realm of Students of Strength. Government reform isn’t the only way to improve the U.S. education system, and it certainly isn’t the best, King said. He wants everyone to know that innovation and entrepreneurship are viable ways to repair what he sees as an unfair and broken system.